Two new 40 metre Sunseeker 131 motor yachts were sold just before the end of 2016, the yard has announced. The first was sold by Nikolaos Makridis of Sunseeker Greece and the second is a joint deal by Sunseeker Poole Sales Director, Spencer Brown, and Technical Manager Andy Jeans. 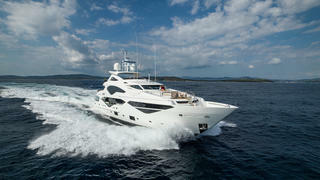 The three-deck Sunseeker 131 represents an evolution of Sunseeker's 40-metre platform. It is based on the builder's tried and tested deep-V hull. On the water she will have a top speed of 23 knots and will have a cruising range of 1,500 nautical miles at 10 knots. The 131 model’s standard layout sleeps 10 guests in five cabins, although this can be customised to accommodate up to 12 people. The onboard garage can hold a tender measuring up to six metres as well as two personal watercraft. A new feature is the extensive use of glass in the master stateroom, saloon and sky lounge to allow for more light-filled spaces and to make the interiors seem larger. The exterior deck arrangement has also been improved with more comfortable deep lounge-style seating. Decks are larger with the sky deck and upper deck aft cockpit lengthened by two metres each, creating room for a bar with fridge, icemaker and sink. The two yachts are currently known as Sunseeker Hull 608 and Sunseeker Hull 609 and both are due to be delivered before the end of 2017.